For February and March, the Gilmore Gallery at the Peacham Library is proud to feature the oil and watercolor paintings of local artist and Peacham Elementary School art teacher RuthKaldor.Ms. Kaldor has been a longtime art educator, first in Cabot and currently in Peacham. She studied under Vermont artists Susan Abbott, Lisa Beach, Jeneanne Lunn, Billy Brauer, Susan Bull Riley and David Gray. 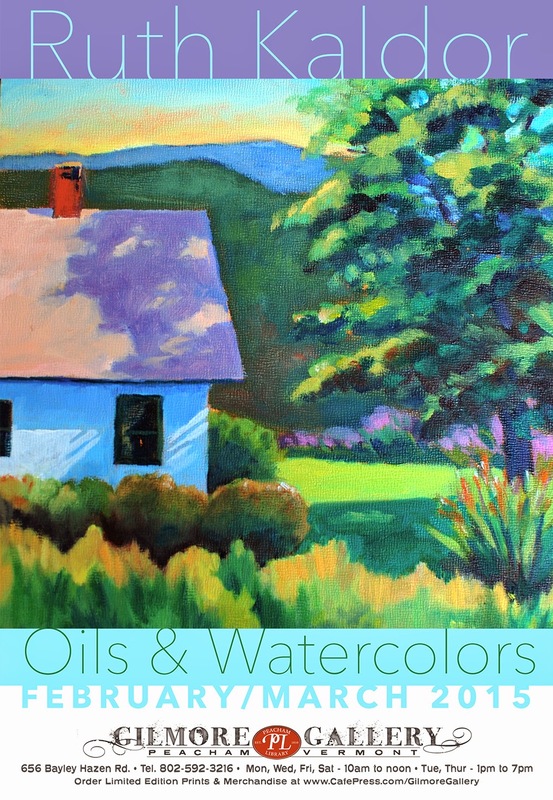 Her work is characterized by clean, saturated colors and often bold compositions featuring classic Vermont subjects (among other things). From still lives to portraits, landscapes to botanical watercolors, Ms. Kaldor’s willingness to explore and broaden her range is impressive. Ruth Kaldor’s oil and watercolor paintings will be on exhibit through the end of March at the Gilmore Gallery at the Peacham Library.